Well, when I first started writing for this blog I promised I would bring some Bavarian into it. So here goes! The German side of my family come from Bavaria. I grew up speaking Bavarian more than Hochdeutsch (standard German), and even today, hearing it is as natural for me as hearing Hochdeutsch. When I speak German now I use Hochdeutsch with a few Bavarian influences, which a lot of German speakers find unusual (especially combined with my English accent!). I feel lucky that I was able to learn two ‘types’ of German, rather than just the one. Now I’d like to share my knowledge of it with you! You may think that learning Bavarian is useless when you already know Hochdeutsch, but if you’re passionate about the German language then I assure you it is not. If you visit München, for example, you will most likely hear and see the Bavarian language in one place or another. And if you’re planning on going to Oktoberfest, you’ll hear plenty of Bavarian being spoken, including Bavarian Trinklieder (drinking songs)! Furthermore, all sorts of people speak it – not just the older generation. And lastly (if you need another reason), it’s just a great language to learn! So if you feel like taking on a new challenge with your German, or if you are just visiting Bavaria and want to know a few words and phrases to understand the locals, then please read on! This post will be a brief introduction to the Bavarian language, and then more posts will follow for those of you who want to learn some vocabulary and phrases. 1. The name of the Bavarian language in German is Bairisch. That is not to be confused with the word bayerisch, which refers to anything Bavarian (eg. “ein bayerisches Haus” a Bavarian house). Basically, Bairisch = language, bayerisch = anything Bavarian. 3. 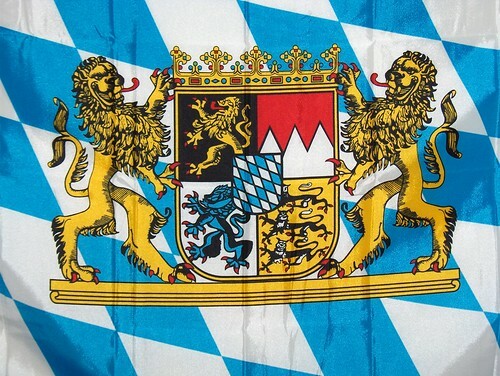 Bavarian is still German, but it is so different to Hochdeutsch that it is often considered a language, rather than a dialect (for the sake of being consistent, I will refer to it as a language on this blog). Even natives from other parts of Germany have difficulty understanding it. So even if your German is very good, you will probably find it a challenge to understand at first! Do not let this make you doubt your German language ability. 4. Although Bavarian can be written, it is predominantly spoken. Even if they spoke Bavarian in daily life, most people would write in Hochdeutsch. This could be because Bavarian is not taught in schools. In addition, there is no official spelling for many Bavarian words; instead, they are written phonetically. 5. However, the Bavarian media often uses the language, especially in adverts and pop songs (which is why you’re likely to see/hear the language a lot when in this part of Germany). Many TV programmes are also in Bavarian. 6. Most Bavarians speak Hochdeutsch. They may or may not speak Bavarian in daily life. In my experience, this is different with everyone – even in a big city like München, you will still find plenty of shopkeepers etc. speaking Bavarian rather than Hochdeutsch. However, they will usually switch to Hochdeutsch if they realise that you are a tourist and/or are having difficulty understanding them. 7. In order to preserve the language, an Englishman (!) has started writing an official Bavarian dictionary. Apparently, it will be finished in 2050. Read more here. 8. Finally, what does Bavarian sound like? To demonstrate, here is a little video of Thomas Müller from the German football team speaking in Bairisch to a reporter after Germany won the World Cup (how have I not mentioned that yet??). That all sounds pretty rude and aggressive in English, right? It is important to point out that what Müller is saying is more light-hearted and humorous in Bavarian, with no offence intended. Bavarian is full of blunt, witty turns of phrase that often include swear words, so even though it might sound rude, it’s usually not! Now you have some basic knowledge of the Bavarian language, plus an idea of how it sounds. How do you feel about the language? Are you interested in learning it? And are there any specific topics (in terms of phrases, vocabulary, etc.) that you’d like me to cover in future posts? Sorry,but there is the word love in Bavarian.Brit thinks he knows it all ! Besides “I mog di ” there is also “I liab di”! Next time at the Oktoberfest check the gingerbread hearts. This article is super helpful!! I’m in the process of learning German because half of my family is in Bavaria. Sometimes their dialect and weird phrases can be very hard to understand, like Müller’s little rant haha. Thanks for the informational article! Thank you for the article. I was unaware there are so many dialects in Bavaria. I really enjoy learning more about Germany. I think I’ll focus on getting Hochdeutsch down before I try dialects. @Linda Good idea, Linda! There really are loads. I went to Koeln once on a school trip and I was totally lost listening to them (although now I don’t even remember what their dialect sounds like). I remember asking one guy to please speak Bavarian, and he actually did! Hahaha. Fantastic article! My mom is from Oberbayern (Sandten) but came to america in her teens. My dad was american and the language was lost with me and siblings. I learned Hochdeutsch on my own have struggled with understanding anything in Bayrisch ( and Deutsch)when I am there. Keep blogging! I enjoy your articles. I was always frustrated as a kid when I visited my uncle and aunt in Ashaffenburg because I had a hard time understanding them. I always thought my German was really lacking until I found out they were speaking Ashabirsch (sp?) (which I understand is still different from Ostfraenkiche Dialekte). King Ludwig is my hero! I would love to learn the language he spoke.I am learning German and like the King love Wagner especually “Lohengrin” and love swans! Hi Again Constanz , sad to say I can’t find the reply you sent 🙁 !. Just read the Catholicism Barvara blog ;). Pronunciation of these words isn’t straight forward for an English speaking me !!?. Is there away to explain the pronunciation ?. @Lawrence Hi Lawrence, the email I sent you was the reply. 🙂 Bavarian is a little tricky but it is predominantly a spoken language rather than a written one, so the way you see it written down is usually phonetical. I will try to include some videos/sounds in future posts to help with this. Hope that helps!! I’ve just came across your blog and am finding the whole regional dialect quite daunting. My grandmothers family are from Oberammergau but as I was raised as a foster child. I’ve only been learning about my biological family as an adult. I would like to learn to speak German, but would also like to speak in my grandmothers native language. Would it be best to begin with Hochdeutsch first before attempting to introduce the regional dialect or perhaps learn them simultaneously do you think? Have you ever heard of the name “Schiels” in Bavaria? If so, how would it be pronounced? My genealogical research tells me my original ancestor came from Bavaria on 1635, and his name may have been Schiels. After much difficulty spelling the name on colonial Maryland I believe his descendants decided to spell the name phonetically, “Skiles,” which is what we have today. What do you think? Any help would be appreciated. All 4 of my grandparents are ‘german’. But we have the last name ‘Sebastian’. Basically a French name. I’ve always been curious how… My mother recently mentioned that her in-laws spoke ‘bayerish’. Is there a region of ‘bayerish’ speaking that ‘Sebastian’ may have come from??? All 4 came to America during WWI and WWII era. ich lernte deutsch und noch lerne und obwohl ich ein bisschen oesterreichisch gelernt habe finde ich bayerisch ziemlich fascienierend. beim Deutsch bin ich selbstgelehrt aber als ich in Lybien mit Oesterreichern arbeitete habe ich ein bisschen dialekt aufgenommen. Bairisch ist ziemlich aenlich, oder? so sieht es mir aus! besten dank und bitte halten Sie mich auf dem Laufenden bleiben! !